The Turkish government and the opposition have indicated that controversial plans to criminalise adultery have been dropped. Opposition leader Deniz Baykal said the government had agreed that such reforms would have to be agreed by both sides. He made the statement flanked by government ministers on Tuesday, following a meeting in Ankara. The opposition has condemned moves to outlaw adultery, as part of a review of the country's 78-year-old penal code. The review is intended to bring Turkish laws closer to those of European Union member states. The adultery ban provoked criticism from women's rights groups and officials scrutinising Turkey's application to join EU. The government and opposition parties have begun debating the reforms in parliament. After meeting ministers on Tuesday, Mr Baykal said: "No motion that does not bear the signature of both parties will be submitted to the assembly." The agreement was confirmed by Justice Minister Cemil Cicek, according to AP ness agency. The BBC's Jonny Dymond in Ankara says the decision represents the first time the country has so publicly stepped back from a legal proposal because of EU objections. A vote on the package of measures is expected to take place in three or four days' time. Many of the legal reforms - which include outlawing torture and imposing stiffer penalties on human traffickers - have been welcomed by the EU and human rights activists. But the clause to make adultery a crime was greeted with dismay by women's groups and liberal commentators, who demonstrated outside parliament against the bill. "Such a law will not save marriages. 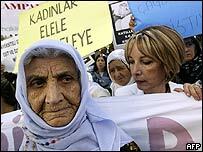 On the contrary, it will ruin them," women's rights advocate Senal Saruhan told AP. "It is a backward approach that will allow the state to intervene in our lives." Prime Minister Recep Tayyip Erdogan, a devout Muslim, had said the clause, introduced late in the draft code, would help protect women from deception. Our correspondent says that the proposal had met with widespread popular support from many in the conservative country. An EU report due out in October will assess Turkey's progress towards meeting EU membership criteria. Guenter Verheugen, the European commissioner for enlargement, commented on the adultery clause during a trip to Turkey last week. "I cannot understand how a measure like this could be considered at such a time," Mr Verheugen said. "It can only be a joke." Adultery used to be illegal in Turkey until 1996, when the Constitutional Court struck the law down because it penalised women more than men. Men were deemed to have been adulterous if they were involved in a long-term affair; but women could be charged if they were unfaithful only once.